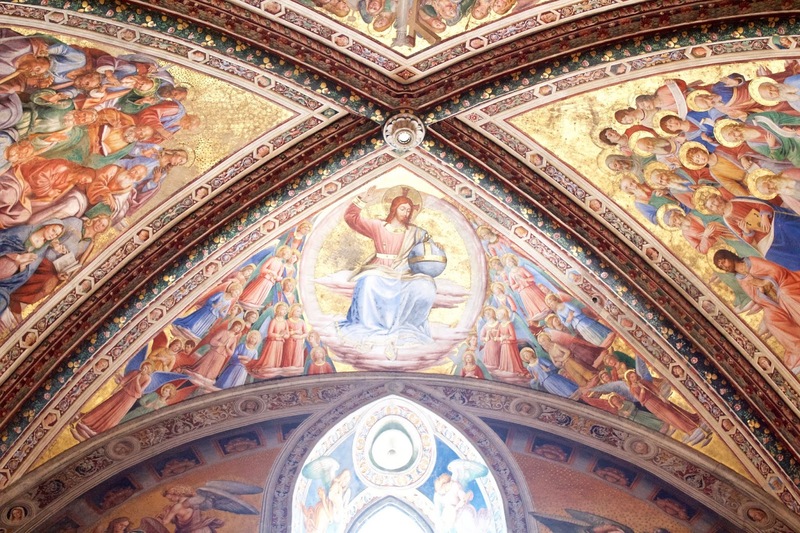 Week 2 of the ART in Orvieto program has been very travel-heavy, visiting Assisi and Florence in addition to an educational jaunt to the San Brizio chapel inside of Orvieto’s Duomo di Santa Maria Assunta, so this report comes to you in two parts. Read the report on week 1 in Orvieto here. Entrance to chapel, looking outward. A visit to this 15th century chapel illustrates the usefulness of taking in medieval sites while philosophizing about religious art in the 21st century. Dr. Rebekah Smick, progenitor of the ART in Orvieto program, has been teaching about the philosophical historiography surrounding the concepts of "image," "symbol," and "metaphor," how the current discourse around artistic activity in our current time is shaped by the thought of previous generations of philosophers. Her course serves to illustrate that current philosophical work on aesthetics did not emerge from a vacuum, but that it instead is the legacy of thinkers within and beyond the Christian and western canons. Do you want to understand why religious imagery is not valued in the institutional "art world" today? You will need to spend some time in the literature of philosophical and theological aesthetics to learn that story. Dr. Skillen encouraging visual literacy among students. Of course, philosophical literature has context and praxis, and that is where another professor, Dr. John Skillen, comes to our aid. Dr. Skillen, Gordon College professor and long-time Orvietano, helps program participants to understand the connections between the theoretical literature Dr. Smick teaches and medieval art that surrounds us. His special passion is making it understood that the physical context of religious art from the medieval period matters, that a fresco cannot be understood if divorced from a recognition of the purpose of the room into which it was painted, the time of the liturgical calendar which it is connected to, or from a conception of the affect on people who viewed it when it was first created. He teased us with the question as we entered the chapel: when does this art become theology? Philosophically, what can we say of the difference, since religious art immediately begs a question about what theological commitments are being expressed? Due to his twenty plus years of living in Orvieto, the beauty and proximity of the San Brizio chapel has been of special interest to Dr. Skillen. Our students, upon entering the chapel, were asked to consider their own church upbringing, if they had one. Was their relationship narratival and episodic (as a Catholic child would be taught to recognize the event and significance of an Annunciation or a Nativity), or was it like the more historically recent example of Protestantism and a scriptural literacy which may lean heavily on memorization of chapter and verse by their number? 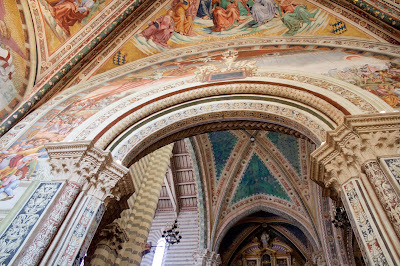 To know what the art performed in that space, one would have to consider the visual literacy that was present in 15th century lay people, to recognize which part of the liturgical year was being suggested by the paintings on the chapel walls, and what related imagery would be instantly recalled by ‘reading’ its symbolism. He likened it to being familiar with sitcoms: even if you have not seen a specific sitcom before, you recognize the importance of the sofa placed centrally within the frame, and can guess that one of the doors leading off screen might be a kitchen. Depending on the era, you may expect a frazzled 50’s housewife to pop out in apron and pearls from said kitchen door, or recognize certain motifs or types of behaviour every time the kid-next door or tangentially-related-friend-of-the-family comes barging in from stage left. 15th century lay people would know what was being suggested by the postures of figures, the use of colour, the selection of certain biblical episodes over others. They had a visual literacy that extended beyond the content of the paintings itself, and was dependent on the context of the larger church building, even to the wider city and its history. false preachers in the end times. Part of learning to "read the room" is knowing where to start with the painting cycle once you are inside the chapel, to scan the images and know what occurs first chronologically. The imagery of the San Brizio chapel is thematically centered on the "end times," so the narrative progresses through the judgment over the wicked, the good, and the tragically lukewarm. The signs of the end times are biblically derived: false preachers come among the people, nursing mothers sense danger, and eventually, the resurrected gain their new bodies, skeletons suddenly enfleshed and crawling from their graves to ascend and be seated with the enthroned Christ. As in Dante’s description, the fence-sitters who never made a choice are sent following a white flag, back and forth, back and forth for eternity ("a chasing after the wind" was the imagery that came to my mind here, recalling Ecclesiastes). Above the images of these judgments are the angels and the elect, those known to be seated near Jesus in heaven. Most nearly seated are Mary and John the Baptist. There are apostles, doctors of the church, patriarchs, and saintly choruses, ordered according to the lyrics of the Te Deum prayer, so that musical literary, that other bastion of liturgical life, is wrapped up in the experience. The middle and top sections of the room get "read" first, then the lower panels, showing Dante and Virgil among others, and images of Dante’s Purgatorio, instantly recognizable to even the minimally educated of the 15th century. When does this art become theology? Dr. Skillen suggested that the key to understanding the distinction in the San Brizio chapel between narrative painting and performed theological contemplation came in recognizing the liturgical function of the space, when it was used for Eucharist. A congregant would see the sacraments being served and view the stories of the last judgments and ask oneself, "Have I decided? Am I headed up to Christ, as are those figures? How should I live?" The space is designed to move one upward to such a conclusion, the gaze moving literally and metaphorically toward the Saviour as you spend time examining the panels. Artistically speaking, all the panels have the east-facing window as their imagined source of light, as if all the figures are being illumined by the light in real time. And, since it is the only set of windows in the chapel, you too are being lit from the same angle and may begin to posture yourself in relation to those nearly life-size figures, seeing yourself among their number. Christ enthroned, around which the elect will gather. 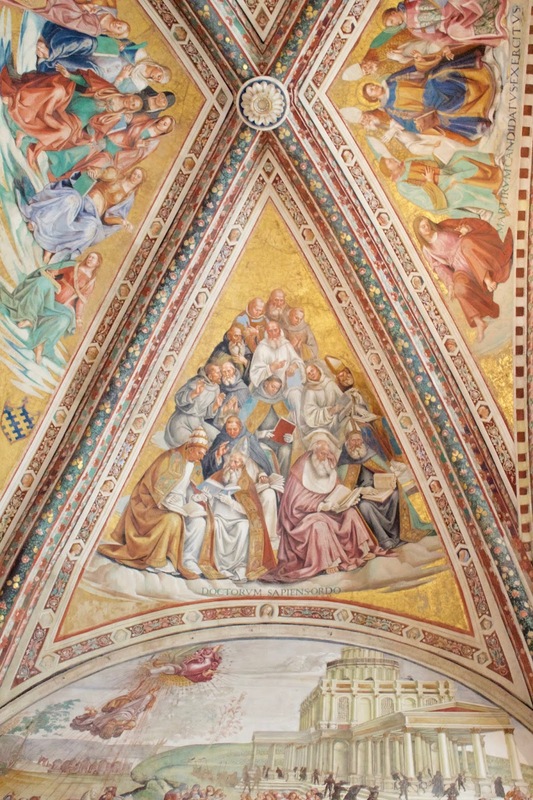 Such experiences, like this one provided by Dr. Skillen’s tour of the San Brizio chapel, are intended to lead you toward a more full understanding of the philosophical material taught during the course. It places authors of the middle ages in context, because we see the same art they saw and have chance to react to it ourselves. Additionally, it helps to understand what came after. Perhaps one will read philosophers like Adorno differently after learning about the often bizarre and tragic lives of the artists who worked on this and other chapels, the dizzying interaction between private money and church politics in medieval Florence, or the impact of Fascism on the architecture of Rome. 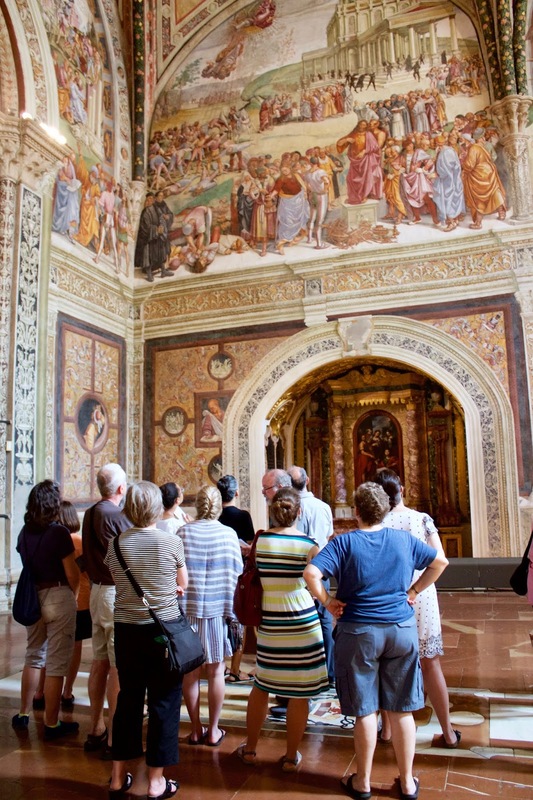 In the true nature of an ICS course, which aims to be gently critical, thorough, and optimistic in equal measure, the ART in Orvieto program helps to tie disparate disciplines and streams of thought together under the banner of patient philosophical consideration. What intellectual souvenirs will you take home from Italy? Christ after the resurrection. Recognize any? 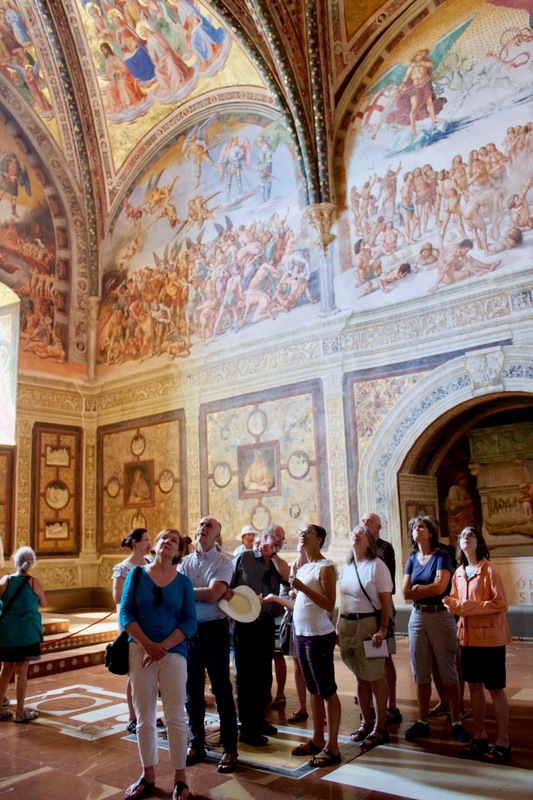 Learn more about the ART in Orvieto program here. Find more about Dr. John Skillen’s work on the importance of appreciating art in context through his book, Putting Art (Back) In Its Place.